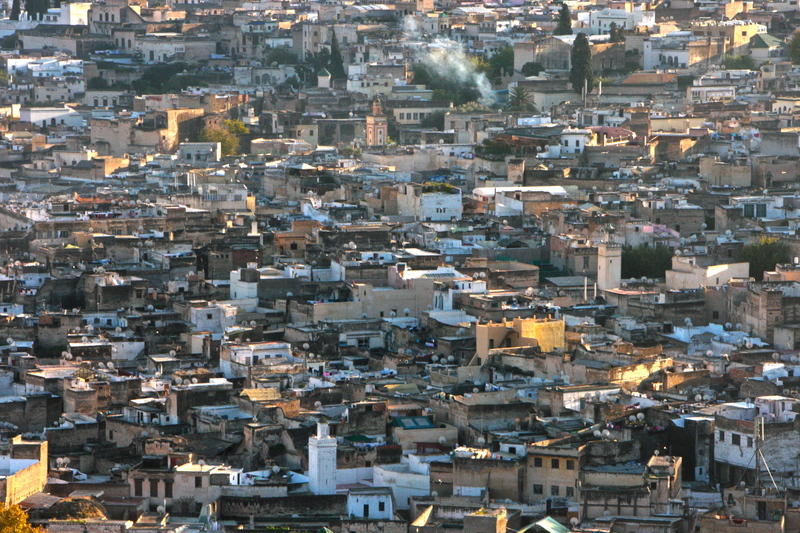 Fes-el-Bali – the old city or medina of Fez in Morocco – is believed to be the world’s largest car-free urban area. 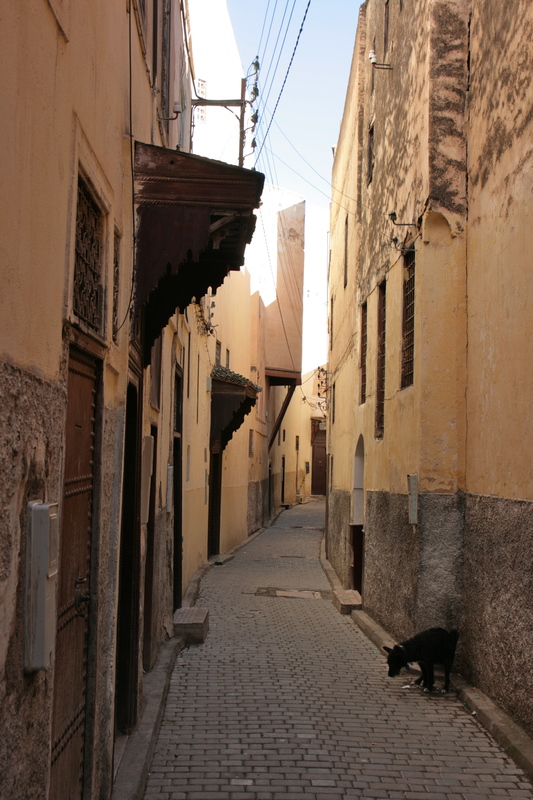 Founded in the early 9th century, the medina covers only around a square mile, but contains over 9000 streets and around 150,000 residents. Virtually unchanged since the gigantic ramparts and seven monumental gates were built around it in the 16th century, the old city is a self-enclosed world, working to its own internal rhythms. Each small district within the city has its own public utilities – water fountains, mosques, baths – and the city’s streets are sharply delineated between the busy public shopping streets and the almost silent private streets of housing leading off to dead ends. Sandwiched between the endless lines of shops selling everything imaginable – from fabulous ornaments and sparkling textiles to fruit and vegetables and tourist tat – are oases of peace: richly decorated medersas built by the Merinids in the 14th century; mosque courtyards; elaborate medieval funduqs (inns for itinerant traders); and tree-filled courtyards of opulent Riyads – the traditional Moroccan home. 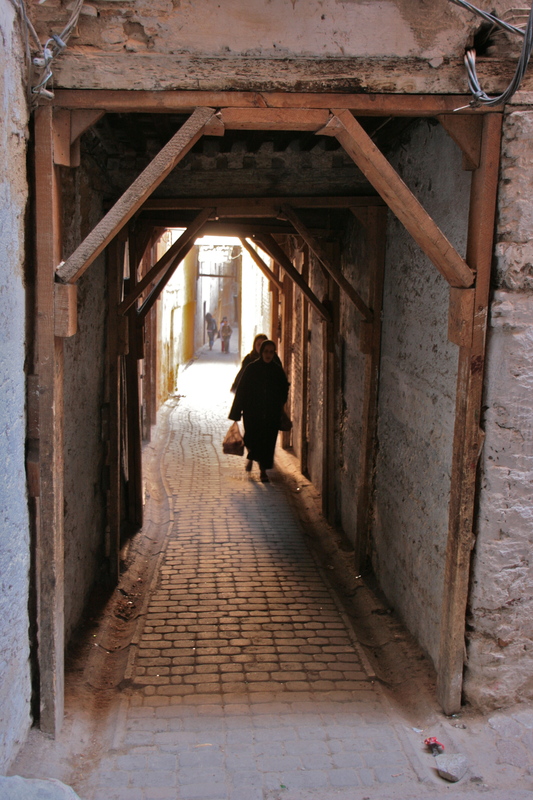 Not surprisingly, the medina of Fez presents problems to the first-time visitor, especially in navigating its tortuous geography. Here, the standard way of getting hold of new cities – seeing them from a high viewpoint – only serves to confuse, the streets disappearing in the extraordinary density of low-rise housing that only becomes apparent when above the city. On the ground, maps are virtually useless for the tourist as most of the streets are either unnamed or only given in Arabic script. At the very centre of the old city, conventional geography seems to stand on its head: covered streets lead around the enormous central mosque in a whirl of dense crowds and heavilly-laden donkeys, and the connecting side streets are so narrow and dark they seem to be underground. In this place, one navigates initially by trial and error as if in a maze (getting lost, retracing one’s steps, discovering dead ends); then by remembering certain features that remind you to turn left or right; then by the gradients (down towards the centre of the city, up to get out). After a few days, certain streets begin to link up in the mind and a skeletal outline of the city is mentally constructed. Only with many weeks – even months – of exploration would the rest of the labyrinth slowly unfold itself and connect together. 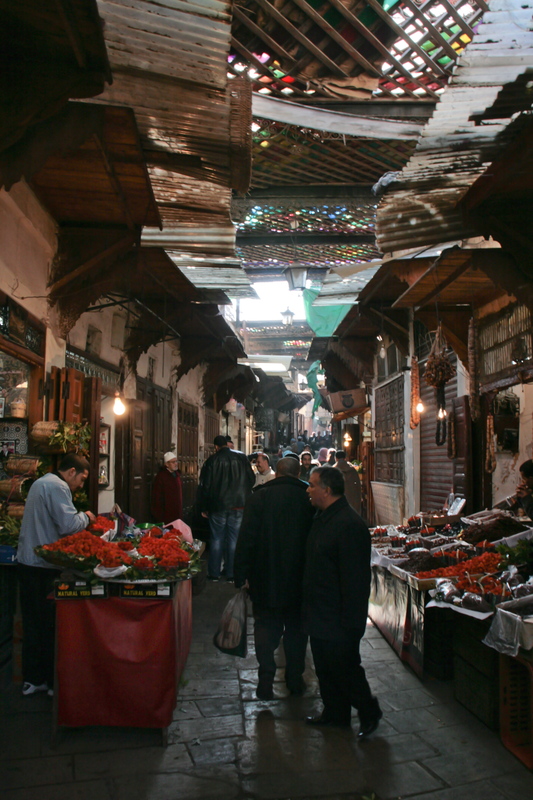 For the tourist, navigating the medina of Fez inevitably brings you into contact with that peculiarly Moroccan character: the faux guide (false guide). Usually male youths, they lay in wait for tourists at strategic points in the old city (each seemingly having their own patch) and approach whenever there is a pause, hesitation or misdirected glance. After leading you to where you want to go they demand payment, usually much more than you wish to give. Most will try and divert you into a shop, presumably owned by a relative or even their employer. The only way to avoid being ensnared is to always know where you are going and thus Fes is ideal picking ground for these would-be-guides, preying on tourists’ most vulnerable weakness – their lack of environmental awareness. And so, in Fez, the tourist becomes like any other commodity being peddled in the souks, stripped of that special status that so characterises Islamic attitudes towards the ‘guest’. 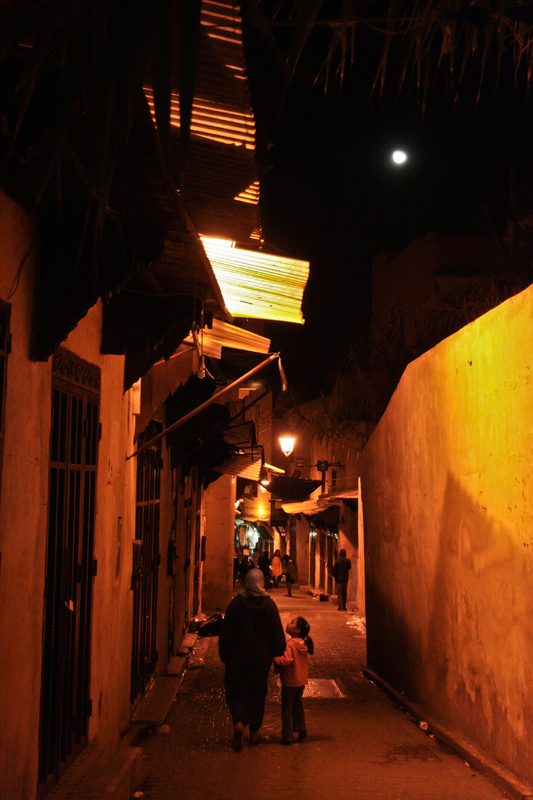 At night, when the shops close down and the touts go home, the medina quietens and takes on a new charm, one defined by private lives – boys kicking around a football, young girls walking with their mothers, groups of men gossiping in doorways, animals heard behind thick walls. 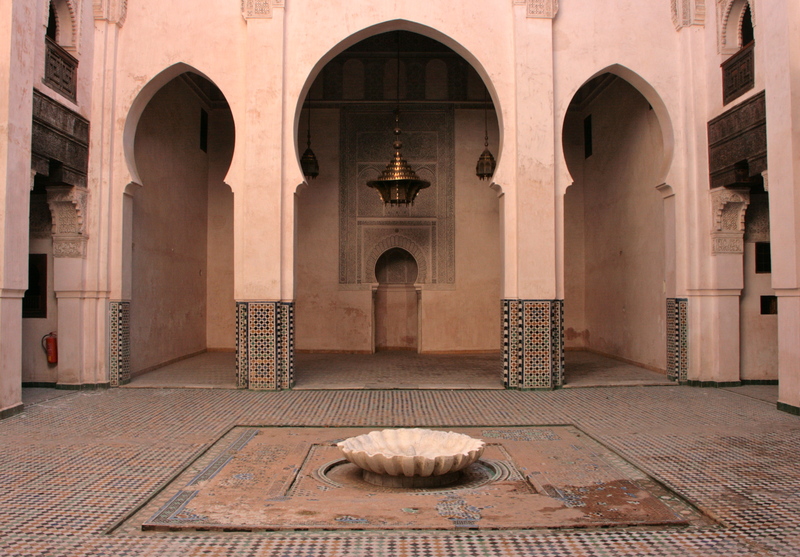 This sharp disjunction between the public world of commerce – aggressive and male – and the private world of the family, is common to all cities, but particularly intense in a city like Fez, where the regular pulsations between these realms have been continuing unchanged for centuries.